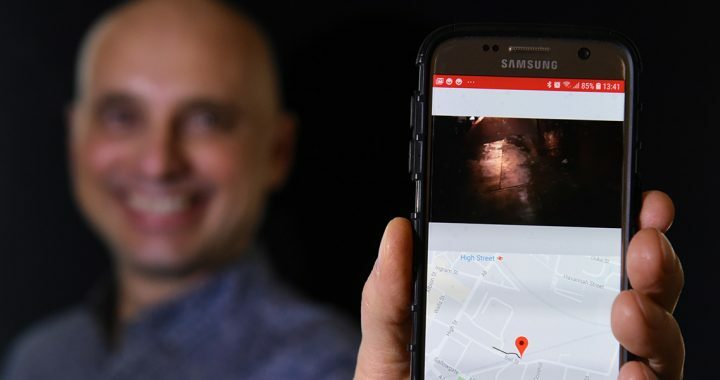 A Staffordshire entrepreneur is following his dream and dedicating his life to making the world around us a safer place to live, thanks to a new mobile app he has developed. Roberto Ferraris from Stafford has been developing his free-to-use app, KronoVisor, for the past 18 months through his business Inar Group. Roberto observed all over the UK a perceived increase in Police appeal signs following a serious incident or road traffic accident and felt he could help to address the issue by coming up with something to improve not only the road network, but the entire community. He now firmly believes the mobile app he has developed, which can be downloaded to your phone for free, will go a long way in helping create a safer world around us and even supporting the Police Force in the process. The entrepreneur, who grew up in Argentina, Ecuador and US and worked in Italy before settling in Staffordshire, said: “I noticed a few years ago a real increase in the use of dashcams and with that Police appeals for footage following incidents such as kidnappings, car accidents, robberies or even murders! "We know it is impossible to have a Police Officer or a Police car on every street corner these days, however I believe this mobile app can help massively. "KronoVisor helps solve crimes and provides a tool when an appeal is made because it allows you see what happens on every public road in any place in the world at any point in time. It also doubles up as a high quality but low-cost dashcam – just download it to your smartphone and it is ready to use. "The idea behind KronoVisor is pretty simple - the more people using it the more useful the app becomes to the community and the authorities in crime prevention and solving reported cases of crime." With a host of dashcam products on the market, Roberto is keen to highlight the unique benefits and advantages of the free-to-use KronoVisor app, which includes the ability to protect people's privacy. Roberto continued: "The mobile app is cloud-friendly and optimised to efficiently upload geo-referenced videos, and by logging into their account online users can explore their maps and videos. "Privacy is important, so KronoVisor also includes an element of artificial intelligence which automatically blurs out faces and number plates on videos shared via the KronoVisor web portal." A firm believer in living for the moment, Roberto is excited about KronoVisor's potential. He concluded: "I didn't want to look back in 20 years and think 'what if', so decided to take the plunge and invest in the development of KronoVisor because of how much value it can bring to society." KronoVisor will be launched in April for Android users – available via the Google Play store – with an iPhone release set for later in 2019. For more information contact us.